Price: €15 (more shipping cost). To buy it, send us an email. 1st Block: The plant (Spring garlic, white garlic and purple garlic), their needs, their diseases. 2nd Block: The machinery what has converted this crop from social cultivation to machining cultivation. But, in our opinion, the most attractive point of this book is that it has been written by garlic farmers and it will be able to read by farmers and technical people. Precio: 15€ (más gastos de envío). Para comprarlo, envíanos un email. 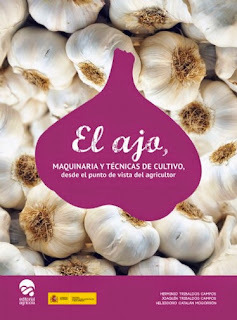 Bloque 1º: La planta (ajo de primavera, ajo blanco y ajo morado), sus necesidades, sus enfermedades. Bloque 2º: La mecanización del cultivo que ha hecho que el ajo pase de ser un cultivo social a un cultivo totalmente mecanizado. Pero sin lugar a dudas lo que hace atractivo a este libro, es que se trata de un manual realizado por agricultores "ajeros" pero capaz de ser leído tanto por técnicos como agricultores. and what about the english edition?? Sorry, but we don't have any news about English edition, unfortunately. If we have any news, we are going to publish it in this page. Hi, how are you in this time? I would like to ask you about the shipping cost of the book to Czech Republic? Or do you have this book in pdf version to send by email or any web link? We are fine... and you? We don't know shipping cost but we think it can be about 15€. We don't have any pdf version. Hello. I want to buy this book (English version). You can send it in Romania? ps,can you tell me what use foliar fertilizer? There isn't English version. It is edited in Spanish only. We only use solid fertilizer for garlic.